We sought to determine which format of the Emotional Intelligence Admission Essay (EIAE) scale, essay or interview, had greater convergent validity with the Schutte Assessing Emotions Scale and yielded more relevant information for use in making admission decisions in health care education. A total of 36 participants (age range, 22–30 years) were randomized to either the essay or the interview group. The essay group (n = 18) wrote a 1000-word essay about conflict negotiation. The interview group (n = 18) answered the same question during a 45-minute Skype interview. Both groups completed the Schutte scale online. The EIAE essay scores were moderately correlated with Schutte scale scores in participants 26 years and older (rs = .71, p < .05). The EIAE essay scores for participants 25 years and younger and the EIAE interview scores for all participants correlated poorly with Schutte scale scores (rs = .08 and rs = .35, respectively; p > .05). In recent years, emotional intelligence has been investigated as an essential skill for health care professionals (Arora et al., 2010; Shakir, Recor, Sheehan, & Reynolds, 2017). Emotional intelligence involves the ability to (a) identify and assess emotions in oneself and others; (b) monitor and regulate emotions in oneself and others; and (c) use one's awareness of emotional information to guide behavior and conflict resolution (Arora et al., 2010). Salovey and Mayer (1990), who first developed the construct, argued that emotional intelligence involves a set of skills distinct from personality traits and traditionally identified forms of intelligence. Researchers further deconstructed emotional intelligence into inter- and intrapersonal intelligences. Intrapersonal intelligence is said to comprise the ability to (a) identify emotion in oneself and recognize its origin; (b) understand how one's emotions influence one's behaviors and affect others; and (c) regulate one's emotions for optimal emotional equilibrium (Elam, 2000; McQueen, 2004). Interpersonal intelligence comprises the ability to (a) accurately assess another's verbal and nonverbal expressions; (b) interact with others with interest and compassion; and (c) successfully negotiate interpersonal conflict (Carrothers, Gregory, & Gallagher, 2000; McQueen, 2004). Although research in this area is relatively new, findings suggest that emotional intelligence is likely shaped by genetics and environment but can be enhanced through experience and education (Petrides & Furnham, 2001). Many health care educators have noted that emotional intelligence is a critical skill for health care professionals (Sommaruga, Casu, Giaquinto, & Gremigni, 2017). Clinical competency in emotional intelligence involves the ability to collaborate successfully with a team of health care service providers; recognize patients' emotions to be able to address their concerns and needs effectively; recognize and manage team members' emotions to defuse possible interprofessional conflicts; communicate effectively with patients, family members, caregivers, service providers, and insurers to advocate for and promote optimal patient care; educate and assist caregivers who may feel confused and poorly equipped to provide care; and interact with people of varied and diverse cultural backgrounds (McQueen, 2004; Victoroff & Boyatzis, 2013). Although emotional intelligence is a critical skill for health care professionals, education programs have only recently begun to consider emotional intelligence as a component of student admission processes. Traditionally, admission criteria for health care education programs have relied heavily on cognitive and noncognitive measures of success and leadership, including grade point average, standardized test scores (e.g., Graduate Record Examinations), interviews, personal statements, and essays (Romanelli, Cain, & Smith, 2006). Although these measures provide accurate predictive information about an applicant's academic performance in health care education programs (Carr, 2009), they do not provide information about an applicant's professional behaviors in the classroom or the clinical setting. Students with higher levels of emotional intelligence, as measured by standardized assessments, show more proficient levels of clinical performance (Codier, Kofoed, & Peters, 2015; Hannah, Lim, & Ayers, 2009; Rankin, 2013); receive higher ratings by clinical supervisors and patients (Arora et al., 2010; Hannah et al., 2009; Rankin, 2013; Victoroff & Boyatzis, 2013); have a greater completion rate of health care education programs (Jones-Schenk & Harper, 2014; Rankin, 2013); and are assessed by supervisors as being more collaborative on treatment teams (Arora et al., 2010; Victoroff & Boyatzis, 2013). The inclusion of emotional intelligence as a criterion for admission during the application process could identify students who have greater potential to demonstrate clinical competencies in emotional intelligence and to succeed in health care programs and careers. Although the potential value of using a measure of emotional intelligence during the admission process is apparent, the most feasible and reliable forms of measuring emotional intelligence are disputed (Conte, 2005). Most measures of emotional intelligence are paper-and-pencil or computer-generated tests (Arora et al., 2010) that either (a) ask respondents to select the most emotionally intelligent response to a posed scenario or (b) determine respondents' ability to identify with a specific skill through a self-report measure (e.g., I am able to monitor and assess others' nonverbal expressions to understand their mood.) (Fiori & Antonakis, 2011). One measure of emotional intelligence that is increasingly used by health care education programs is the structured interview in which student applicants are interviewed by trained evaluators who have interrater reliability in the administration of a standardized assessment of emotional intelligence (Latif, 2004; Levashina, Hartwell, Morgeson, & Campion, 2014; Rees et al., 2016). Interview questions and scoring are standardized, and interviewers follow a precise protocol to determine how questions can be modified or expanded if applicants do not answer accordingly at first (Pau et al., 2013). For example, interviewers can use prompts to verbally redirect applicants who digress from the question topic. To create a feasible and reliable instrument to measure emotional intelligence during the admission process for health care education programs, the authors developed the Emotional Intelligence Admission Essay (EIAE) scale (Gutman & Falk-Kessler, 2016). For this measure, applicants write a 1000-word essay that is rated for emotional intelligence level. Because conflict negotiation is a key determinant of emotional intelligence (McQueen, 2004; Victoroff & Boyatzis, 2013), the essay asks respondents to describe a conflict that occurred in a work, school, or personal situation. Applicants are then asked to describe each person's emotions, desires, and needs to determine whether they can identify and assess emotions in themselves and others. To understand applicants' awareness of how their behaviors and emotions affect others, applicants are asked to describe how they may have knowingly or unknowingly contributed to the conflict. To gain insight into applicants' ability to use their awareness of emotional information to guide behavior and navigate problems, applicants are asked to describe their attempts at conflict resolution. The scale also assesses the ability to acknowledge responsibility rather than externalize blame and to cooperate with others and value their contributions (Figure 1). The EIAE scale includes five items that are assessed with a 4-point Likert scale (ranging from 0 = no evidence to 3 = strong evidence). The EIAE scale has been found to have high content validity, interrater reliability, and internal consistency (Gutman & Falk-Kessler, 2016). Instructions for the Emotional Intelligence Admission Essay. We sought to determine whether the EIAE scale could be used to guide and evaluate structured interviews as well as to understand which EIAE format—written essay or structured interview—could more effectively yield information about emotional intelligence. Could the EIAE be used as an interview protocol? Which EIAE format—interview or essay—yields scores with greater convergent validity with an established, valid emotional intelligence instrument, the Schutte Assessing Emotions Scale (Schutte scale) (Schutte, Malouff, & Bhullar, 2009; Schutte et al., 1998)? Which EIAE format—interview or essay—yields more relevant data for admission recommendations? This instrument development study determined which EIAE format—structured interview or essay—yielded more relevant information for admission decisions regarding applicants to health care education programs. One group of participants (n = 18) was asked to write an essay based on EIAE questions and to complete the Schutte scale. A second group (n = 18) was asked to participate in a structured interview based on EIAE questions and to complete the Schutte scale. At the end of the study, both groups were evaluated to determine which format, interview or essay, yielded EIAE scores with greater convergent validity with the Schutte scale. Convergent validity is the degree to which one instrument with content validity correlates with another instrument that measures the same phenomenon and has content validity (Portney & Watkins, 2015). Additionally, the essay rater and interviewer comments recorded on each score sheet were analyzed to determine (a) whether the different formats yielded different types of information and (b) how many prompts the interviewer used to assist participants in answering questions. This study was approved by the Columbia University Medical Center institutional review board, and all participants provided written informed consent. Participants were graduate students who were recruited through e-mail invitations and flyers. We chose as participants health care students who were already matriculated. We believed that it was unethical to recruit applicants to participate because they could feel coerced. The first 36 graduate students who agreed to participate and who met the inclusion criteria were randomized to either the essay group or the interview group. Participants were 22 to 30 years old to control for the possible effect of life experience on emotional intelligence, and all participants were currently enrolled in a health care education program at Columbia University Medical Center (e.g., medicine, nursing, dentistry, physical therapy). Students in the occupational therapy program were excluded because they had written the EIAE essay question as part of their application process. The EIAE scale is a five-item instrument that uses a 4-point Likert scale with a range of 0 (no evidence) to 3 (strong evidence). It requires approximately 15 minutes to complete (10 minutes to read; 5 minutes to score) (Figure 2). An open-ended comment section is provided to allow raters to record additional observations. Possible total scores range from 0 to 15, with higher scores indicating higher emotional intelligence. Content validity was high, as determined by a panel of experts on emotional intelligence (content validity index = 1.0; Lawshe, 1975). Convergent validity with the Schutte scale was moderate (r = .46, p < .02). Interrater reliability between two trained faculty raters was high (intraclass correlation coefficient = .91, p < .000). Internal consistency of the scale was high, with a Cronbach's alpha of .95 (Schutte et al., 1998, 2009). Emotional Intelligence Admission Essay scale. ©2017 S. A. Gutman and J. P. Falk-Kessler. Reprinted with permission from S. A. Gutman and J. P. Falk-Kessler. The Schutte scale is a 33-item, 5-point (ranging from 1 = strongly disagree to 5 = strongly agree), self-reported measure of emotional intelligence that requires approximately 5 minutes to complete. Respondents are provided with statements about inter- and intrapersonal intelligence skills and are asked to rate how strongly they identify with each statement (e.g., I am able to understand others' emotions by reading their facial expressions.). Total scores range from 33 to 165, with higher scores indicating higher levels of emotional intelligence. Internal consistency was high, with a Cronbach's alpha of .90. Test-retest reliability was moderately high (r = .78, p < .05). Convergent validity with the Emotional Quotient Inventory (Bar-On, 1997) was moderate (r = .43, p < .05) (Schutte et al., 1998, 2009). Although the Schutte scale has reported moderate to high reliability and convergent validity as a self-report scale of emotional intelligence, information is not available on its predictive validity or convergent validity with an observational or case-based emotional intelligence scale. In case-based scales, participants respond to a scenario by selecting an emotionally informed response. Essay group. Participants in the essay group were asked to complete the 5-minute Schutte scale through an electronic platform. Once completed, participants received written instructions for completion of the essay (Figure 1) and were asked to submit it electronically within 1 month. Interview group. Participants in the interview group also were asked to complete the 5-minute Schutte scale through an electronic platform. Once completed, participants were then asked to participate in a 45-minute Skyped interview occurring within 1 month of Schutte scale completion. Interviews were conducted by a physician educator with expertise in the development and implementation of admission interview procedures to assess emotional intelligence among medical school applicants. The interviewer used the same EIAE questions and scale (Figures 1–2) to interview participants and score performance. Participants received the EIAE questions 1 week before their interview to allow sufficient time to generate responses. If interview participants digressed or evaded answering questions, the interviewer provided a maximum of two separate verbal prompts per question to redirect participants back to the query. Immediately afterward, the interviewer scored the EIAE scale, which required 5 minutes. As part of the study procedure, we asked the interviewer to spend an additional 10 minutes documenting the interview in narrative form. The EIAE essays were rated by an occupational therapist and academic educator with 20 years of clinical and academic student supervisory experience. As stated earlier, the EIAE interviewer was a physician educator who had 37 years of academic and clinical student supervisory experience and 5 years of experience in developing and implementing admission interview procedures to measure emotional intelligence among medical school applicants. Both the essay and the interview raters received 3 hours of training in EIAE administration and scoring from one of the authors (S.A.G.). The raters established interrater reliability with each other at an intraclass correlation coefficient of .92 (p < .01) for essay and interview rating combined. Raters were asked to use the EIAE open-ended comment section to record their observations and impressions. Additionally, the interviewer was asked to record how frequently verbal prompts were used to redirect participants when they digressed from the topic. Chi-square analysis was used to determine whether the essay and interview groups were equivalent on the demographic variables of age, race, ethnicity, and gender. A Mann–Whitney U test was used to identify differences between the EIAE and Schutte scale scores for the essay and interview groups. A Spearman rho correlation coefficient was used to determine which format, essay or interview, yielded EIAE scores with greater convergent validity with Schutte scale scores (Portney & Watkins, 2015). Data analysis was performed with SPSS software, version 24, and the significance level was set at α < .05. Interviewer narratives and EIAE score sheet comments were analyzed to determine (a) which format yielded more useful information relevant to admission decisions and (b) how many prompts were used by the interviewer to assist participants in answering questions. A total of 36 participants (female = 30; male = 6) completed the study. 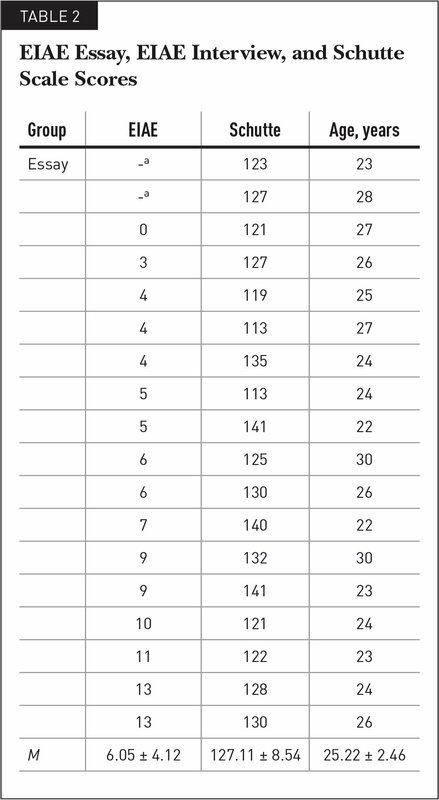 Participant demographics are shown in Table 1 according to essay and interview groups. No statistically significant differences were found between groups for age, race, ethnicity, or professional program. Although there was a statistically significant difference between the number of male and female participants in the study (chi-square = 7.875, p < .005), there was no statistically significant difference between the male-to-female ratio in each group (chi-square = 0.800, p < .37). A Mann–Whitney U test found no statistically significant difference between Schutte scale scores for the interview (M = 133.05 ± 9.97) and essay (M = 127.11 ± 8.54) groups. A statistically significant difference was found between interview (M = 11 ± 4.99) and essay (M = 6.05 ± 4.12) EIAE scale scores (Z = −3.319, p < .001), with the interview group receiving higher ratings. Participants in both the essay and interview groups had low correlation between EIAE and Schutte scale scores (essay group: rs = .28; p > .05; interview group: rs = .35; p > .05) (Table 2). However, when participants in each group were separated by age, those 26 and older (n = 8) in the essay group showed moderate correlations between EIAE essay and Schutte scale scores (rs = .71, p < .05). This moderate correlation between EIAE and Schutte scale scores was not found for participants who were 26 years or older (n = 9) in the interview group (rs = .28, p > .05). Correlations between EIAE and Schutte scale scores for both the essay and interview groups decreased as age decreased. The correlation between EIAE essay and Schutte scale scores for participants 26 years or older (n = 8) was rs = .71 compared with rs = .08 for participants 25 years or younger (n = 10). Similarly, the correlation between EIAE interview and Schutte scale scores for participants 26 years or older (n = 9) was rs = .28 compared with rs = .13 for participants 25 years or younger (n = 9). Narratives and open-ended comments recorded by the interviewer showed that verbal prompts were provided an average of five times per interview either to redirect participants back to the topic or to help them to address questions more fully. The recorded comments of both the essay rater and the interviewer showed several themes. Participants (a) frequently showed little attempt at negotiation and conflict resolution (nine essays, seven interviews); (b) commonly insisted that they were “right” and perceived other participants in the conflict as “wrong” (eight essays, nine interviews); (c) often engaged in behavior that escalated the conflict (nine essays, seven interviews); (d) reported having difficulty speaking face to face with others about the conflict and instead relied on e-mail and text messages as forms of communication (six essays, eight interviews); (e) showed little insight into the ways in which their behaviors contributed to the conflict (nine essays, seven interviews); and (f) commonly perceived that they completed a majority of the tasks associated with group projects at work or school while others contributed substantially less (eight essays, eight interviews). Our primary research question sought to determine which EIAE format—essay or interview—would have greater convergent validity with an established, valid emotional intelligence instrument, the Schutte scale. Our findings showed that neither EIAE format strongly correlated with Schutte scale scores until scores were separated by age. Once participants in both the essay and interview groups were separated by age, we found that EIAE essay scores for participants who were 26 to 30 years old were moderately correlated with Schutte scale scores, suggesting that insight into one's own emotional intelligence—as indicated by self-report Schutte scale scores—was greater with age. This finding is supported by recent neuroscience literature reporting that human brain development may not be complete until 25 to 26 years, when the brain regions that contribute to emotional intelligence may mature (Crone & Dahl, 2012; Lebel & Beaulieu, 2011). At this age, individuals may begin to gain greater insight into their emotional intelligence skills, including competencies for which enrichment is still needed. Interestingly, the finding that EIAE essay scores were more strongly correlated with self-report Schutte scale scores as a factor of age was not replicated with EIAE interview scores. The EIAE interview scores were poorly correlated with Schutte scale scores despite separation of participants by age. We believe that possible reasons for this difference between the EIAE essay and interview formats may lie in the type of information that can be accurately culled from the two formats. An essay format may remove the affect-related verbal and nonverbal cues that people learn to rely on to perform well in face-to-face interviews (e.g., smiling, nodding in agreement, showing confidence, and cooperating with the interviewer). Although students may learn to use these cues in evaluation situations, such as interviews, they may not use them in real-life conflicts. This may have been particularly true in our sample of highly educated and achievement-oriented students, who were likely overrehearsed in interview skills as a byproduct of the many interviews they encountered during their education. This finding is supported by literature identifying the social desirability response in which people tend to present themselves more favorably in interview situations (van de Mortel, 2008). The essay may have been a more novel format through which the participants were asked to describe their emotions, behaviors, and cooperation with others. As a result, participants may not have been as adept in presenting their responses. This may have been particularly true for younger students, who may not have had as much opportunity to analyze and reflect on their emotions through writing. Although the EIAE scale can be used as an interview protocol, our findings suggest that an essay format may provide more accurate information about an applicant's emotional intelligence. Perhaps our most interesting finding was the schism between the rater's and the interviewer's perceptions of participants' emotional intelligence compared with participants' self-perceptions. In both the interview and essay groups, participants tended to provide higher self-ratings of emotional intelligence compared with the interviewer and the essay rater, and this difference accounted for the low correlations between Schutte scale and EIAE scale scores. Although participants generally perceived their emotional intelligence as high, the rater and the interviewer found that many participants showed unprofessional behaviors and lack of insight. This was particularly true for participants 25 years and younger, who may not have had as much opportunity to engage in cooperation, negotiation, and conflict resolution in professional settings through which socialization to professional behaviors often occurs. This finding also could be attributed to generational differences between the interviewer and the essay rater, who were 50 years or older, and the participants, who were 22 to 30 years old. The interviewer and the essay rater were members of the Baby Boom generation, whereas the participants were Millennials, or members of Generation Y. The two generations have different views on commitment to work and the use of technology and social media (Berkup, 2014). Although Baby Boomers are reported to value work above leisure and gain self-efficacy through work, Millennials seek greater balance between work and leisure and obtain self-efficacy through the use of social media and technology (Berkup, 2014; Gibson & Sodeman, 2014). In six essays and eight interviews, participants reported having difficulty speaking face to face with others about conflict and compensated for this lack of communication through the use of e-mail and text messages. This finding is supported by research suggesting that our current use of technologies may contribute to deficits in face-to-face social communication among members of the Millennial generation, who have been raised using this technology (Gibson & Sodeman, 2014; van Deursen, Bolle, Hegner, & Kommers, 2015). Our final research question sought to determine which EIAE format, interview or essay, yielded more relevant information for admission decisions. As discussed earlier, because the EIAE essay format may remove the affect-related verbal and nonverbal cues that people overlearn to perform well in interview situations, this format may be more useful when assessing the emotional intelligence of students who have substantial interview experience. However, this finding may not be replicated with students who lack interview experience, and further research with this population is warranted. The EIAE essay format held greater feasibility compared with the interview format because it required significantly less time and fewer resources—15 minutes to read and rate an essay compared with 50 minutes to conduct and rate an interview. One concern with the use of essays in the admission process is the inability to determine whether students wrote independently or received assistance. This concern could be addressed by requiring applicants to write their essays online (or in person) during a circumscribed block of time during which the essay question is first presented. Although this procedure would not prevent the applicant from obtaining assistance, it would substantially decrease the likelihood of obtaining outside assistance. A further concern with the use of the essay format is that some students may not understand the question and therefore may write inappropriate responses. 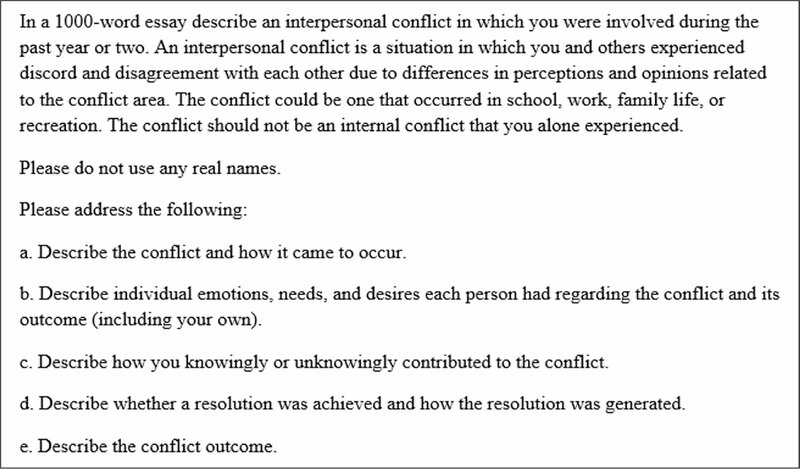 Despite the definition of interpersonal conflict presented in the essay question, two participants wrote about intrapersonal conflicts, and as a result, their essays could not be scored. During an interview, applicants can be redirected to provide appropriate responses that specifically address the question. One limitation of our study was the small sample size of 36 participants who were all students at Columbia University Medical Center. Although participants were from varied backgrounds and professional programs, they were all highly educated, notably achieving students. The findings may have been different with students who were not as accomplished and rehearsed in the navigation of academic systems, including interviews. A second limitation of the study involved our use of a self-report measure, the Schutte scale, to assess emotional intelligence. Self-report measures of emotional intelligence yield only data about a participant's perceptions and may differ from scores attained with externally rated observational or case-based instruments. 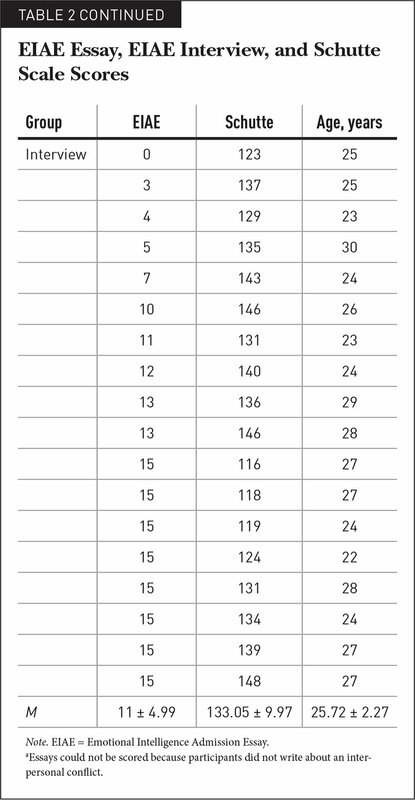 We selected the Schutte scale because most available observational and case-based scales with high content validity require a fee per student, making them too expensive for use in a study. Because our results showed that some students perceived their emotional intelligence to be significantly higher than the scores assigned by external raters using an observational scale, we suggest that admission processes should use observational or case-based emotional intelligence scales. Future research is needed to determine whether observational and case-based scales, similar to the EIAE scale, can more effectively identify health care students who will likely show difficulty with professional behavior. A third limitation was that most of our study participants were female. Researchers have debated whether gender affects emotional intelligence, and several studies have shown conflicting findings. Some found no differences, and others found gender differences (Fernández-Berrocal, Cabello, Castillo Gualda, & Extremera, 2012; Petrides & Furnham, 2000; Petrides, Furnham, & Martin, 2004). Based on these inconsistent findings, we are uncertain whether our findings may have been different with a sample that was at least 50% male. A final limitation was that we did not address the idea that emotional intelligence skills can be shaped by learning and experience (Bray, O'Brien, Kirton, Zubairu, & Christiansen, 2014). Some health education programs may choose to offer professional development courses in which emotional intelligence skills are taught. Students who score low on emotional intelligence skills because they have not been exposed to life experiences that could cultivate emotional intelligence may respond well to education and develop proficient emotional intelligence skills essential for health care professionals. Future research is needed to assess EIAE interview and essay formats with a larger sample that includes students from varied universities and at differing achievement levels. In addition, samples should contain a greater percentage of male participants to better investigate whether gender affects emotional intelligence. The EIAE scale should be further assessed for convergent validity with an observational or case-based emotional intelligence instrument; predictive validity is currently being established in a separate study. Additionally, future research should assess training strategies that can help students to enhance their emotional intelligence in preparation for health care careers. This study sought to determine which form of assessment of emotional intelligence, EIAE essay or interview, would best yield data relevant for admission decisions. We found that EIAE essay scores but not interview scores were correlated with participants' self-report Schutte scale scores as a factor of age. For participants who were older than 26 years, EIAE essay scores were moderately correlated with self-reported Schutte scale scores, indicating that insight into emotional intelligence may result from brain maturation and life experience. The EIAE essay format may remove the affect-related verbal and non-verbal cues that people overlearn through substantial interview experience. Although the EIAE essay format was more cost-effective and time-efficient than the interview format, the essay format did not allow for redirection if participants misunderstood the question. Further research with larger sample sizes and equivalent percentages of male and female participants is needed to replicate the study findings. Bar-On, R. (1997). The Emotional Quotient Inventory (EQ-i): A test of emotional intelligence. Toronto, Ontario, Canada: Multi-Health Systems, Inc.
Portney, L. G. & Watkins, M. P. (2015). Foundations of clinical research: Applications to practice (3rd ed.). Philadelphia, PA: F. A. Davis. Dr. Gutman is Professor of Rehabilitation and Regenerative Medicine, Dr. Falk-Kessler is Assistant Dean, Vice Chair, and Professor of Rehabilitation Medicine, and Ms. Sarafian is Instructor of Rehabilitation and Regenerative Medicine, Columbia University Medical Center, Programs in Occupational Therapy, New York, New York. Dr. Barbour is Emeritus Associate Professor of Medicine, Morsani Medical College, Lehigh Valley Hospital, Division of Neurology, Allentown, Pennsylvania. This research was supported in part by the Virginia Apgar Academy of Medical Educators, Columbia University Medical Center. Address correspondence to Sharon A. Gutman, PhD, OTR, FAOTA, Professor of Rehabilitation and Regenerative Medicine, Columbia University Medical Center, 8th Floor, 710 West 168th Street, New York, NY 10032; e-mail: sg2422@cumc.columbia.edu.